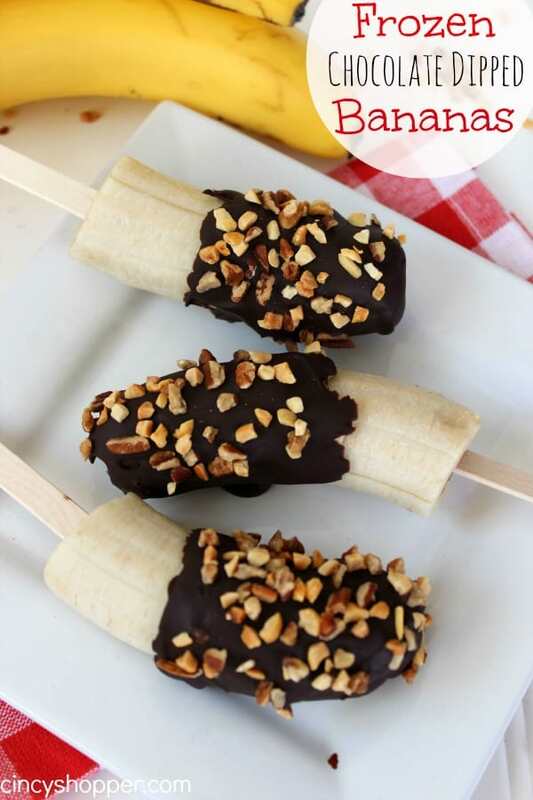 If you are looking for a fun cold treat to enjoy this summer consider making up this Frozen Chocolate Dipped Bananas Recipe. Frozen treats in the summer are always a must. A must in our household for both mom and dad as well as the kiddos. A few weeks back I shared our Frozen Chocolate Dipped Kiwi Pops with you. They were a hit with all of us. I am a huge banana fan. I love Dole Frozen Banana bites but they are on the pricy side. 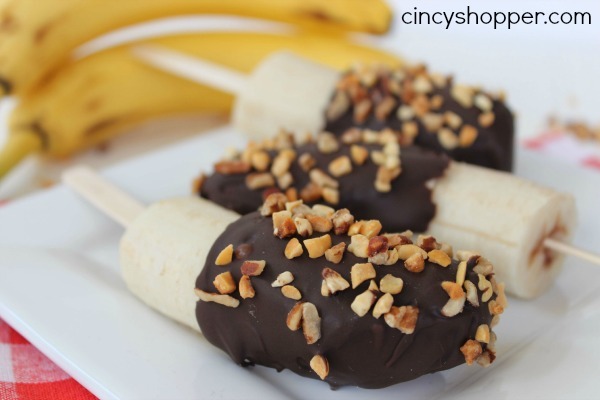 So last week I whipped up these Frozen Chocolate Dipped Bananas for me and the hub. 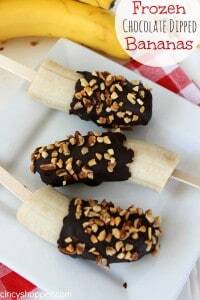 These Frozen Chocolate Dipped Bananas were also a hit with the kiddos (I let them dip their own). Even now that they are teens somehow if they make it themselves they are more likely to eat it. 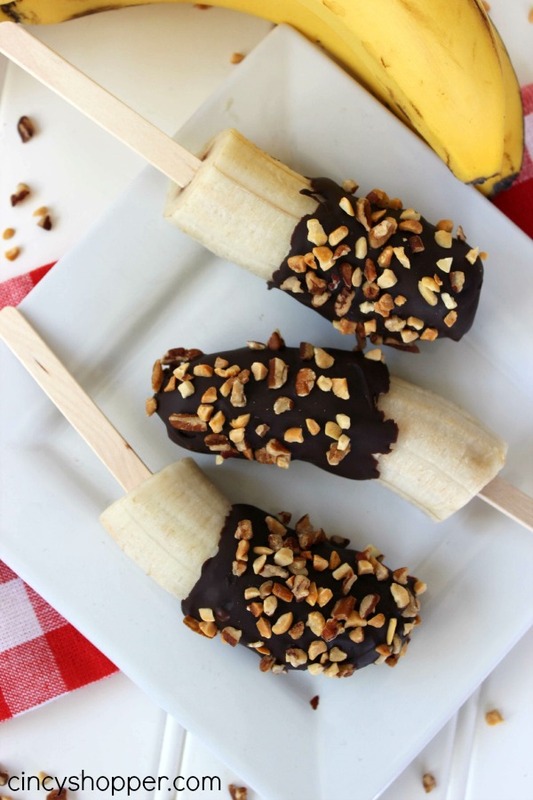 Frozen Bananas and chocolate are a perfect combo. Making up these yummy cold treats is so simple. Just grab your bananas, chocolate and nuts if you prefer them on top. You can do this recipe with or without Popsicle sticks. I made mine with sticks so we could enjoy them while spending time outdoors. Prepare a try or cookie sheet by lining with wax or parchment paper. Insert a Popsicle stick into the cut end of each banana half and place on tray. Place in freezer until frozen (2-3 hours). 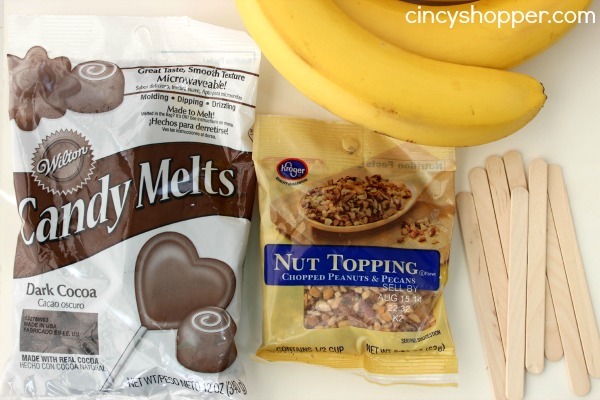 Melt chocolate by heating in microwave for 30 seconds then stirring and repeating until melted and smooth. 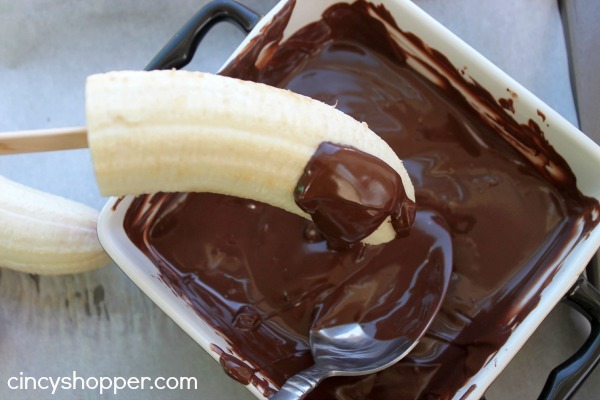 Dip and roll banana in chocolate to make sure it is completely covered. Place on back on lined tray. If you are looking for other fun Summer treats be sure to check out the Strawberry Shortcake Pops Recipe, CopyCat Wendy’s Frosty Recipe, Root Beer Float Pops Recipe, Easy Blueberry Cheesecake Ice Cream Recipe, Frozen Chocolate Dipped Kiwi Pops Recipe and all of the great Drink Recipes I have shared with all of you. Are you following my Summer Treats Board on Pinterest? If not be sure to check it out and follow. I have been pinning some great Summer Treats to keep all of us cool this summer. My kids would love these. THanks for the idea!